Thanks to requests from my friends on Twitter and Facebook, I decided to write a midweek market analysis. Hopefully this could help my fellow traders understand what’s been moving our favorite currency pairs lately, and maybe help us form trade ideas in the next couple of days. First up are the market themes that have been influencing price action. Greek Bailout: deal or no deal? Early this week we saw high-yielding currencies rally across the board after the Greek Parliament approved a new set of austerity measures that might help get the economy 130 billion EUR worth of new bailout money. Unfortunately, the cancellation of a meeting of the euro zone finance ministers implied that Greece won’t be receiving anything just yet. Credit ratings agency Moody’s rained on the risk rally’s parade when it downgraded credit ratings of Italy, Malta, Portugal, Slovakia, Slovenia, and Spain and even put the U.K., France, and Austria on downgrade watch. Yikes! The BOJ surprised markets yesterday when it not only added 10 trillion JPY to its asset purchasing program, but also revealed its 1.0% inflation target. The yen weakened across the board as markets took the central bank seriously on its pledge to keep its economy afloat. It’s time to look at the comdolls! If we take a look at the chart below, we can see that as of writing, all of the comdolls are posting intraweek gains against the dollar. The Kiwi is the strongest so far with a 0.64% gain, which is probably helped by a strong retail sales report. A rise in oil prices also kept the Loonie well supported at a 0.49% gain, while mixed economic reports from Australia probably weighed on the currency as it’s only showing a 0.19% intraweek gain. So what’s next for the comdolls? 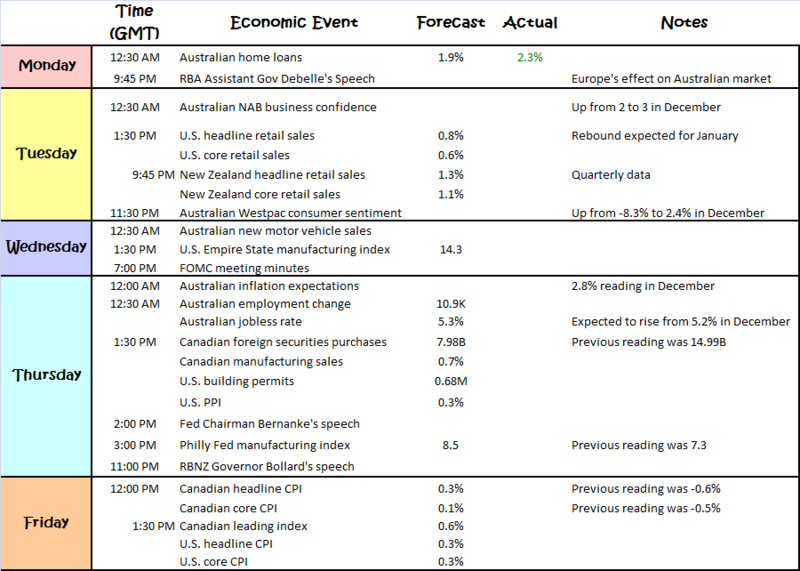 On the calendar below we can see that we still have the U.S. PPI, Philly Fed index, and the Canadian and U.S. CPI reports to possibly influence our trades. Of course, we can’t forget that investors are still at the edge of their seats on whether Greece would be able to pay its debts on time! Alright, that’s it for me today! Did I miss anything, or do you guys have any questions? Don’t hesitate to contact me through one of the links below! Hope you’re earning pips this week! All three commodity-related economies are set to release a bunch of top-tier reports this week so there could be plenty of opportunities for us to trade the news. New Zealand will print its retail sales figures on Tuesday while Australia is set to report its jobs data on Thursday. Towards the end of the week, Canada will release its manufacturing sales data as well as its core and headline CPI figures. Alright, that’s it for me today! If you want to ask or share anything, just holler through one of the links below. You know where to reach me!